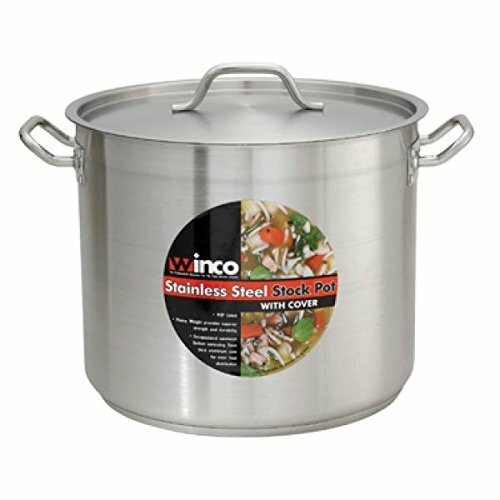 Winco SST-24, 24-Quart 10.25-Inch High 13.4-Inch Diameter Stainless Steel Stock, Pot With Cover, Tri-ply Heavy-Duty Bottom for Efficient Heat Distribution, features the smart design with wide tri-ply bottom and high sidewalls for even and thorough heat distribution. The bottom consists of an aluminum core encased in two sheets of premium quality heavy-duty 18-8 stainless steel. This sturdy and reliable kitchenware is a perfect option for preparing stocks, soups, broths, stews, sauces, braising meats, vegetables and more. It is provided with tight fitting stainless steel lid for the better heat retention and flavor infusion. The 24-quart stockpot is a must for any restaurant kitchen. Moreover this amazing pot is NSF approved. This professional stockpot with cover features the smart design with wide tri-ply bottom and high sidewalls for even and thorough heat distribution. The bottom consists of an aluminum core encased in two sheets of premium quality heavy-duty 18-8 stainless steel. This sturdy and reliable commercial grade stock pot is a perfect option for preparing stocks, soups, broths, stews, sauces, braising meats, vegetables and more. It is provided with tight fitting stainless steel lid for the better heat retention and flavor infusion.